The University of Technology Eindhoven (TU/e) is a leading research-driven technical university with over 7,500 students and about 3,000 employees, of which 1,900 academic staff. The TU/e has over 1,200 running research projects funded by the EU, national and international organizations, and local government. 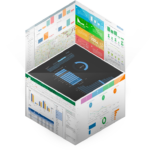 These projects provided €93.2 million revenue in 2012.
icCube enabled the TU/e and our partner InsideVision to build dashboards and data integrations using a Scrum-like method. At the end of each day, a new release was made available for end users to review and to respond to, resulting in a high-quality and user-friendly system. icCube flexible on-the-fly authentication and authorization connectors allowed for integration into the TU/E security system defining access rights up to cell granularity. A demo version of the solution is available here. "Fully integrated with its internal systems (Oracle EBS), the TU/e and icCube have realized one uniform reporting platform for projects. The platform can be accessed from any place or browser and iPad by Board of Advisors and faculty directors, as well as project controllers."